When the historian Arthur Schlesinger, Jr., published his bestseller The Disuniting of America in 1991, he didn’t seriously entertain the worst-case scenario suggested by the title. At the time, the Soviet Union and Yugoslavia were imploding, while separatist movements in Quebec, East Timor, Spain’s Basque country, and elsewhere were already clamoring for their own states. But when it came to the United States, Schlesinger’s worries were principally focused on the far smaller battlefield of the American classroom and what he saw as multiculturalism’s threat to the mythic “melting pot.” Although he took those teacup tempests seriously, the worst future Schlesinger could imagine was what he called the “tribalization of American life.” He didn’t contemplate the actual dismemberment of the country. Today, controversies over hate speech and gender politics continue to roil American campuses. These, however, are probably the least important conflicts in the country right now, considering the almost daily evidence of disintegrative pressures of every sort: demonstrations by white supremacists, mass shootings and police killings, and the current dismantling of the federal government, not to speak of the way cities and states are defying Washington’s dictates on immigration, the environment, and health care. The nation’s motto of e pluribus unum (out of many, one) is in serious danger of being turned inside out. A country that hasn’t had a civil war in more than 150 years, where secessionist movements from Texas to Vermont have generally caused merriment not concern, now faces divisions so serious, and a civilian arsenal of weapons so huge, that the possibility of national disintegration has become part of mainstream conversation. Indeed, after the 2016 elections, predicting a second civil war in the United States — a real, bloody, no-holds-barred military conflict — has become all the rage among journalists, historians, and foreign policy pundits across the political spectrum. Particularly after Charlottesville, the left is convinced that President Trump and his extremist allies are intent on inciting the “alt-right” toward violence against a broad swath of his administration’s opponents. The right is convinced, particularly after the shooting of Louisiana Republican Congressman Steve Scalise, that the “alt-left” is armed and ready to revolt alongside “Mexican murderers and rapists.” Foreign Policy columnist Thomas Ricks has been taking the temperature of national security analysts on the likelihood of a future civil war. In March, their responses averaged out to a 35% chance — and that number’s been climbing ever since. A sign of the times: Omar El Akkad’s American War, a novel about a second civil war, has been widely reviewed and has sold well, though whether readers are taking it as a warning or a how-to manual is not yet clear. Sure, most Americans don’t yet fall into irreconcilable factions. But if you consider the transformation of Yugoslavia from vacation spot to killing field in two short years after 1989, it’s easier to imagine how a few demagogues, with their militant supporters, could use minority passions in this country to neutralize majority sentiments. All of which suggests why the “American carnage” that Trump invoked in his inaugural address could turn out to be a self-fulfilling prophecy. Of course, it’s not just Donald Trump. Globally speaking, the fledgling American president is more symptom than cause. The United States is just now catching up to much of the rest of the world as President Trump, from his bullying pulpit, does whatever he can to make America first in fractiousness. When it comes to demagogues and divisiveness, however, he has plenty of competition — in Europe, in the Middle East, indeed all over our splintering planet. The recent referendum on independence in Catalonia is a reminder that a single well-timed blow can break apart the unitary states of Europe as if they were nothing but poorly made piñatas. True, it’s not clear how many Catalans genuinely want independence from Spain. Those who participated in the referendum there opted overwhelmingly in favor of secession, but only 42% of voters even bothered to register their preference. In addition, the announced relocation of 531 companies to other parts of the country is a sobering reminder of the potential economic consequences of secession. However the standoff may be resolved, though, separatist sentiments are not about to vanish in Catalonia, particularly given the Spanish government’s heavy-handed attempts to stop the vote or the voters. Such splittism is potentially contagious. After Britons narrowly supported Brexiting the European Union (EU) in a referendum in 2016, the Scots again began talking about independence — about, that is, separating from their southern cousins while remaining within the EU. Catalans have a different dilemma. A declaration of independence would promptly sever the new country from the European Union, even as the move might spread independence fever to other groups in Spain, particularly the Basques. The British and the Catalans have delivered something like a prolonged one-two punch to the EU, which until recently had been in continuous expansion: from six member states in 1957 to 28 today. Losing both Great Britain and Catalonia would mean kissing goodbye to more than one-fifth of that organization’s economic output. (According to 2016 numbers, the United Kingdom contributes 2.7 trillion euros and Catalonia 223 billion euros to the EU’s 14.8 trillion euro gross domestic product.) That’s the economic equivalent of California and Florida peeling off from the United States. The question is whether the British and Catalan votes are the culmination of a mini-trend or the beginning of the end. Although Brexit actually gave a boost to the EU’s popularity across its member states (including England), Brussels continues to experience pushback from those states on immigration, financial bailouts, and the process of decision-making. Euroskeptic movements like the Alternative für Deutschland in Germany and the Freedom Party in Austria have met with growing success and rising voter support, even in Euro-friendly countries. In that continent’s future lie: a possible Czexit as a right-wing billionaire takes over as prime minister of the Czech Republic and looks to create a governing coalition with a vehemently anti-immigrant and anti-EU partner; a Nexit if Euroskeptic Geert Wilders succeeds in expanding his political base further in the Netherlands; and even an Italexit as voters there have bucked the “Brexit effect,” with 57% now favoring a referendum on membership. Outside actors, too, have been hard at work. The Kremlin under Vladimir Putin relishes a weaker EU, if only so that its own immediate neighbors — Ukraine and Georgia — will stop leaning westward. Donald Trump has similarly embraced the Euroskeptics in a bid to spread what former top adviser Steve Bannon has termed the “deconstruction of the administrative state” to Europe. Those who might enjoy an EU-style frisson of schadenfreude look at Europe’s ills as a case of the chickens coming home to roost. Many European governments supported the American-led conflicts in Afghanistan, Iraq, Libya, and Syria that have shattered the Greater Middle East, sending refugees by the hundreds of thousands toward the EU. One crucial result: anti-immigrant sentiment and Islamophobia have fueled far-right “populist” parties across Europe. In the process, the continent is threatened with being torn apart at the seams in an echo of the developments in the countries from which the refugees are streaming. Think of it as the war on terror transposed to a different key. This parallel could be seen in a particularly poignant fashion in the independence referendum in Kurdistan that was held just before the Catalan vote. Iraq has been at risk of disintegration ever since the United States invaded in 2003 and removed the tyrannical but unifying hand of Saddam Hussein from the tiller of state. Proposals to divide the country into three autonomous parts presided over by Kurds, Sunnis, and Shia began circulating in Washington within years of the invasion, then-Senator Joe Biden’s “soft-partition plan” being perhaps the best known of them. The Kurds made Biden’s proposal a reality by carving out their own autonomous region in the northern part of Iraq. Now, after a referendum that secured overwhelming support (with a turnout of more than 70%), the Kurds, with their peshmerga forces, are trying to make the divorce official. The Iraqi military has been on the move to stop them and now two American-trained and armed militaries face off against each other in that explosive region. The Turks and Iranians similarly eye the effort to secede with considerable wariness in light of Kurdish autonomy movements in their own countries. Syria too, despite the recent military victories of the Russian-backed government in Damascus, remains divided with a de facto Kurdish state of Rojava in its north. And it’s not just the Kurds. Libya is in the midst of a civil war. In devastated Yemen, various conflicts continue, all aggravated by an intervention and brutal air campaign sponsored by the Saudis and other Gulf States with the assistance of Washington. And Saudi Arabia and Bahrain face significant Shia challenges within their borders. Elsewhere in the world, too, the center is anything but holding, as things threaten to fall apart. Around Russia, frozen conflicts — in Ukraine and Georgia — have paralyzed states that otherwise might make a bid to join the EU or NATO. In China, separatist movements burn on a low flame in Xinjiang and Tibet. The ethnic cleansing of the Rohingya is just one of many problems of fragmentation in Myanmar. Secessionist movements are gaining momentum in Cameroon and Nigeria. In Brazil, three southern states are mobilizing to secede from the rest of the country. In the Philippines, a Muslim terror insurgency in southern Mindanao took and held much of a major city for months on end. In the past, secession was all about creating new, smaller nation-states. The most recent wave of division, however, may not stop with the breakdown of states into smaller pieces. Nationalism is a relatively recent phenomenon. Prior to the consolidation of the French nation in the nineteenth century, for instance, the inhabitants of the country thought of themselves as Bretons, Provençals, Parisians, and the like. Contrary to various founding myths, the nation didn’t exist from time immemorial. It had to be conjured into existence — and for a reason. The nineteenth century witnessed the first great modern shattering as people weaponized the new concept of “nation” and companion notions of ethnic solidarity and popular sovereignty in their struggles against empires. The revolutions of 1825 in Greece and Russia, the 1848 “spring of nations” throughout Europe, the subsequent unification of Germany and Italy — all were blows against the empires presided over by the Habsburgs, the Romanovs, and the Ottoman sultans. World War I then dispatched those weakened empires to their graves in one huge conflagration. After the war ended, a Middle East of heterogeneous nation-states and a new group of independent Balkan countries emerged from the defunct Ottoman Empire. Imperial Russia briefly fragmented into dozens of smaller states until the Soviet Union glued them back together by force. The house of the Habsburgs fell and the Central European countries of Poland, Czechoslovakia, and Hungary crawled out from under the wreckage. The second great shattering, which stretched across the middle span of the twentieth century, accompanied the collapse of the colonial empires. The British, French, Dutch, Italian, Portuguese, and German overseas colonies all achieved independence, and a new global map of nation-states emerged in Africa, Asia, and to a lesser extent Latin America where decolonization had largely occurred a century earlier. The end of empire, of colonialism, and of the Cold War thrice shattered and remade the map of the world. You could certainly argue that the fracturing taking place today is nothing but the continuation of those three transformations. The Cold War demanded the unity of Europe (and the unity of its component parts), so only in the post-Cold War era could Catalans and Scots explore the option of independence with any hope of success. The emergence of Kurdistan had been made possible by the breakdown of the arbitrary Middle East borders created in the aftermath of World War I, and so on. Historical change isn’t ever going to wash over the world in one even wave. That’s a hard reality to which North Koreans, who still live in a semi-feudal, putatively Communist, and fiercely nationalist state, can attest. Yet the most recent events undoubtedly represent not just a fourth great shattering, but one that falls into a new category entirely. The current divisions in the United States have nothing to do with empires or colonialism or possibly even the Cold War. The debates over the EU’s viability center on the obligations Europeans have to each other and to those arriving as refugees from distant conflicts. The forces threatening to tear apart nation-states elsewhere suggest that this elemental unit of the international system may be nearing the end of its shelf life. Consider, for instance, the impact of economic globalization. The expansion of trade, investment, and corporate activity has long had the effect of drawing nations together — into cartels like OPEC, trade communities like the European Union, and international institutions like the International Monetary Fund. By the 1970s, however, economic globalization was eating away at the exclusive prerogative of the nation-state to control trade or national currencies or implement policies regulating the environment, health and safety, and labor. At the same time, particularly in industrialized countries like the United Kingdom and the United States, income inequality increased dramatically. The wealth gap is now worse in the United States than in Iran or the Philippines. Among the top industrialized countries, according to the Organization of Economic Cooperation and Development, the gap between the richest 10% of the population and the poorest 10% has grown appreciably larger. Even among countries where inequality has dropped because of government efforts to redistribute income, the perception has grown that globalization favors the rich, not the poor. Fewer than half of French respondents to a 2016 YouGov poll believed that globalization was a force for good — even though income inequality has fallen in that country since the 1970s. Having once reduced tensions among countries and strengthened the nation-state, economic globalization increasingly pits peoples against one another within countries and among countries. Other forms of globalization have had a similar effect. Facebook and Twitter, for instance, have connected people in unprecedented ways and provided a mechanism to mobilize against a variety of societal ills, including dictators, trigger-happy police, and sexual harassers. But the other side of the ability to focus organizing efforts within digital affinity groups is the way such platforms Balkanize their users, not by ethnicity as much as by political perspective. Information or opinions challenging one’s worldview that once appeared in the newspaper or occasionally on the evening news get weeded out in the Facebook newsfeed or the Twitter stream of one’s favorite amplifiers. Ethnic cleansing by decree has been largely overtaken by ideological cleansing by consent. What’s the point of making the necessary compromises to function in a diverse nation-state when you can effectively secede from society and hang with your homies in a virtual community? Given the polarizing impact of economic and technological globalization, it’s no surprise that the politics of the middle has either disappeared or, because of a weak left, drifted further to the right. Donald Trump is the supreme expression of this stunning loss of faith in centrist politicians as well as such pillars of the institutional center as the mainstream media. Since these figures and institutions delivered an economics of inequality and a foreign policy of war over the last three decades, the flight from the center is certainly understandable. What’s new, however, is the way Trump and other right-wing populists have stretched this disaffection, which might ordinarily have powered a new left, to encompass what might be called the three angers: over immigration, the expansion of civil rights, and middle-class entitlement programs. Fueled by a revulsion for the center, Trump is not simply interested in undermining his political opponents and America’s adversaries. He has a twin project, promoted for decades by the extreme right, of destroying the federal government and the international community. That’s why the fourth great shattering is different. In the past, people opposed empires, colonial powers, and the ideological requirements of the Cold War by banding together in more compact nation-states. They were still willing to sacrifice on behalf of their unknown compatriots — to redistribute tax revenues or follow rules and regulations — just on a smaller scale. Nationalism hasn’t gone away. Those who want to preserve a unitary state (Spain) as well as those who want out of the same state (Catalonia) appeal to similarly nationalist sentiments. But today, the very notion of acting in solidarity with people in a territorial unit presided over by a state is fast becoming passé. Citizens are in flight from taxes, multiculturalism, public education, and even the guarantee of basic human rights for all. The fourth great shattering seems to be affecting the very bonds that constitute the nation-state, any nation-state, no matter how big or small. In 2015, before the Brexit vote and before Donald Trump emerged as the frontrunner in the Republican Party primary, I published an “essay” at TomDispatch in which a geo-paleontologist (a field I made up) looked backward from 2050 at the splintering of the international community. That piece later became my dystopian novel, Splinterlands, which spelled out in more detail how I imagined those fracture lines would widen over time until geopolitics became micro-politics and only the very smallest units of community were able to weather the global storm (including, of course, the literal storm of climate change). Dystopian novels are supposed to be warnings, but let me assure you of this: dystopian novelists rarely want their predictions to come true. I’ve watched, horrified, as the words of Splinterlands seemed to leap off my pages and into the world in 2017. I’m no Cassandra. I don’t believe that this fourth great shattering is inevitable. Empires, colonialism, and the Cold War are largely things of the past. But the fracturing of that hitherto indivisible unit of the world community — the nation-state — could still be arrested. It’s not particularly popular to defend the state these days in the United States. Even before Trump came to power, the American state was radically expanding its surveillance capabilities, its war-making capacities, and — among other grim developments — its punitive policies toward the poor. No surprise then that Trump’s promise to deconstruct the federal government struck such a chord among voters, even some on the left. But the alternative to the current state should not be the non-state. The real alternative is a different state, one that is more democratic, more economically just and sustainable, and less aggressive. For all of its institutional violence and bureaucratic flaws, the state is still the best bet we have for protecting the environment, stretching out a safety net for all, and providing equitable education opportunities to everyone, not to mention its ability to band together with other states to tackle global problems like climate change and pandemics. French king Louis XIV famously said, “L’État, c’est moi.” Today, thanks to the first three shatterings, across much of the globe the state is no longer Louis XIV or a colonial administration or a superpower overlord. The state is — or at least should be — us. If we lose the state in a fourth great shattering, we will lose an important part of ourselves as well: our very humanity. 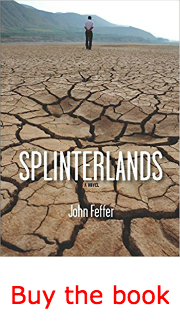 John Feffer is the author of the dystopian novel Splinterlands (a Dispatch Books original with Haymarket Books), which Publishers Weekly hails as “a chilling, thoughtful, and intuitive warning.” He is the director of Foreign Policy In Focus at the Institute for Policy Studies and a TomDispatch regular. [Note for TomDispatch Readers: If you want to understand our world, one place to start is John Feffer’s riveting dystopian novel Splinterlands (as you’ll see from today’s post). Sadly enough, only a year or so after Dispatch Books published it, Splinterlands reads ever more like the news and ever less like the imaginative leap that it once seemed to be. And when it comes to dystopian non-fiction, don’t forget to pick up two other recent Dispatch Books volumes, historian Alfred McCoy’s In the Shadows of the American Century: The Rise and Decline of U.S. Global Power and Pulitzer Prize-winner John Dower’s The Violent American Century: War and Terror Since World War Two. If you want to make sense of the decline of the planet’s “lone superpower” and of where we’re heading, you couldn’t ask for three better books.